Good to see an update! Looking forward to next Wednesday! Hey, that editor looks pretty snazzy. Did you guys write your own UI or is that external? Hey, it’s all our own UI. Just curious… What game engine do you use? We use our own tech all the way. 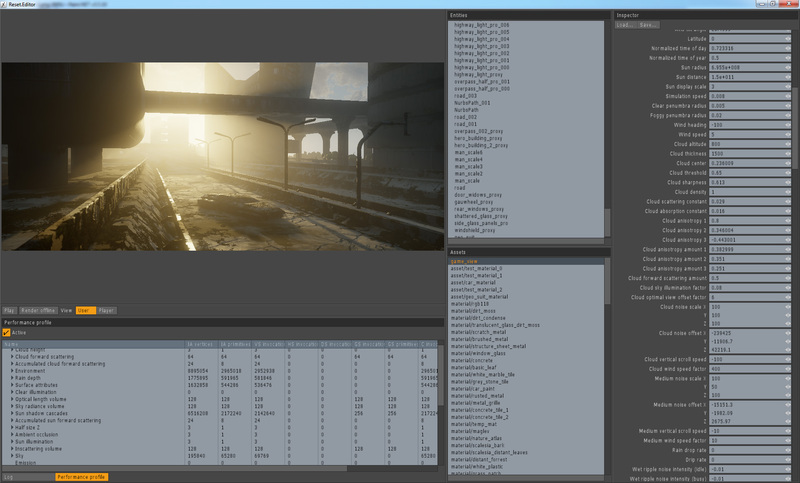 By videos, the Reset engine seems the level of CryEngine or beter. Congratulations for the work have been doing, I look forward to the game. Had a look at the game editor screenshot. DS, HS… WOw So this is definitely A DirctX11 game! Can’t ask for better. Hope you guys stay independent for ever. Wow, you guys really overwork yourselves in that massive corp HQ. Well, keep up the good work and have a nap or two occasionally. On your shelves, I see the delorian, and also, is that the most kickass autobot of them all, Jetfire?! Your epicness just leveled up, guys. Hey wisher, nice to see you here DeLorean is the coolest car ever! That isn’t something from Transformers, it’s a Northrop/Rockwell/Bell VF-1J Block 5 Valkyrie air superiority variable fighter jet from the Japanese animated SciFi TV series Chōjikū Yōsai Macross (which indeed served as one of the inspirations for Transformers, and also for Battletech by the way). Cool, you recognized it I’m a huge fan of the original Macross DYRL movie and of course Robotech. On a side note, i still have both of your signatures (from the SH beta) on my wall. Now they have even more value! Awesome trailer guys, and all in-game, can’t wait to see how the engine works, it looks pretty sick! Can you tell me the make and\or brand of chair you guys are sitting on? They look very comfortable. Are they from IKEA? Martela Logic, I think the model number is 400. Comfortable, adjustable and durable.